This knife is anything but subtle. 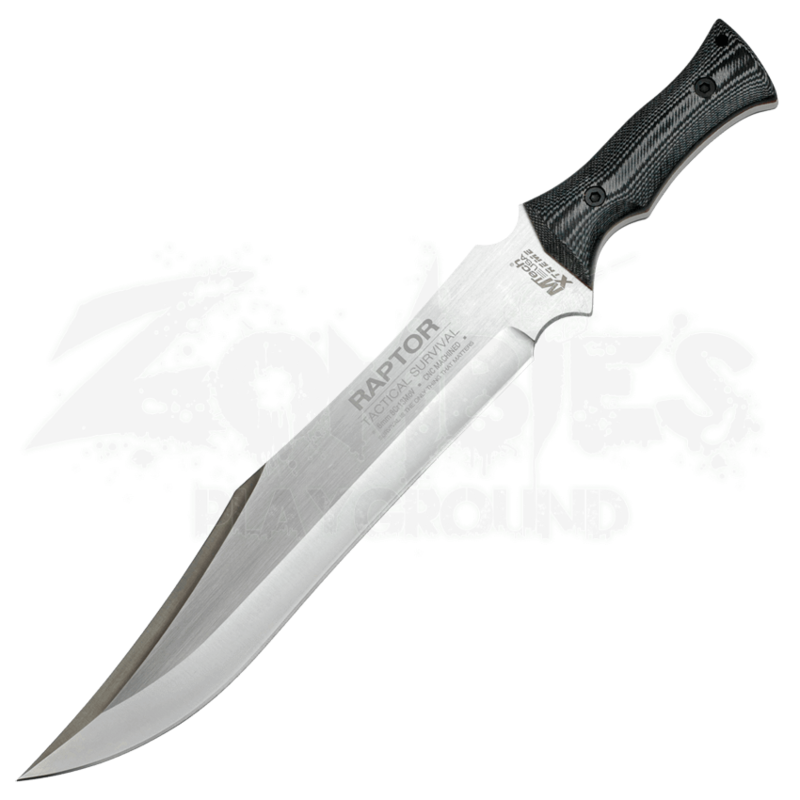 Bold and vicious, just like its namesake, this Raptor Tactical Survival Knife is a killer blade that has a lot going for it, including solid construction that makes it one heck of a tool for anyone to carry and wield. It might be fair to call this little knife a mini-machete, thanks to its impressive size. The blade is crafted entirely from 440C stainless steel that has been CNC machined to perfection. It features a short spine and a classic clip-point with a long, shallow curve on the back end, creating a mild curve on the blades leading edge and a wicked point at the tip. The knife features a double choil at the base of the blade, allowing for finger-place for a more versatile grip when needed. The black micarta handle hides a full-tang construction, while its texture provides for a solid and secure grip that you would expect out of any good survival knife. The handle also features a small lanyard hole, for convenience and use. The knife comes complete with a leather sheath, with a built-in belt strap. Whoever said that bigger is not always better has not handled a big survival knife like this. Survival is all that matters, and when you want a solid knife to depend on, whether you are camping or going the distance in a zombie outbreak, you will want this Raptor Tactical Survival Knife.